The IHRC has lined up a raft of acclaimed speakers and guests for its upcoming Genocide Memorial Day. Inaugurated by the IHRC five years ago as a more inclusive alternative to Holocaust Remembrance Day, GMD aims to highlight and help prevent genocidal actions all around the world, irrespective of race, ethnicity or religion. GMD rejects the notion that there is a hierarchy of victims depending on their background. It seeks to hold people accountable by highlighting those people and power structures responsible for perpetrating genocidal acts and by remembering the victims. 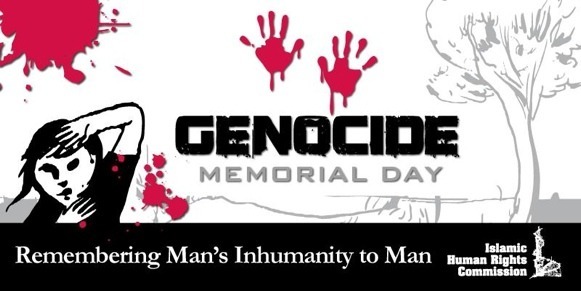 The theme of 2014 Genocide Memorial Day is ‘Steps to Genocide’. It intends to bring to attention the political, social and economic processes that precede all genocides and which provide an indicator of looming crisis. Among the speakers is Michel Warschawski, founder of the anti-Zionist Alternative Information Centre and a founder and leader of the pioneering anti-Zionist socialist organization Matzpen. Warschawski will outline the dehumanisation of the Palestinians that has been a necessary precondition of their oppression. The subject is particularly poignant given that GMD is timed to coincide with the anniversary of the cessation of Operation Cast Lead, the brutal military attack launched by the Israeli army against the Gaza Strip at the end of 2008. Another speaker is the leading decolonial thinker Ramón Grosfoguel, Associate Professor of Ethnic Studies at the University of California, Berkeley. Prof. Grosfoguel has previously spoken at the IHRC on the subject of whether Islamophobia constitutes a form of racism. Parallel events will be held in Paris and Amsterdam this year.